Concord, North Carolina (July 19, 2017) – Coming off another top-10 finish two weeks ago at Iowa Speedway, Christian Eckes is ready to get back to business when the ARCA Racing Series presented by Menards returns to action during Friday night’s Sioux Chief PowerPex 200 at Lucas Oil Raceway. In the midst of a nine race season schedule driving the No.15 Toyota Camry for Venturini Motorsports (VMS), the New York State native has strung together six-consecutive top-10 finishes in as many races. Highlighted with a runner-up finish at Elko Speedway, Eckes has notched three top-5’s and led an impressive 272 laps during his first six season starts. In preparation for Friday’s main event, Eckes joined VMS teammates Zane Smith and Spencer Davis and spent this previous weekend testing at LOR’s half-mile facility. ARCA Racing Series practice is from 12:15 – 2 p.m., followed by General Tire pole qualifying at 5 p.m. Pre-race ceremonies and driver introductions begin at 8:30 p.m. with the green flag waving just after 9 p.m. The 100-lap ARCA/CRA Super Series late model race precedes the 200-lap ARCA national tour event. The Sioux Chief PowerPEX® 200 is live on FS1 at 9 p.m. ET. ARCAracing.com will feature live timing and scoring and live chat of all ARCA Racing Series on-track activities. Venturini Motorsports (VMS), fielding cars for over 30-years in the ARCA Racing Series presented by Menards, is one of the premier NASCAR driver development programs in the country. Multiple team championships and consistent on-track success, VMS has evolved into one of the most recognizable names in motorsports. 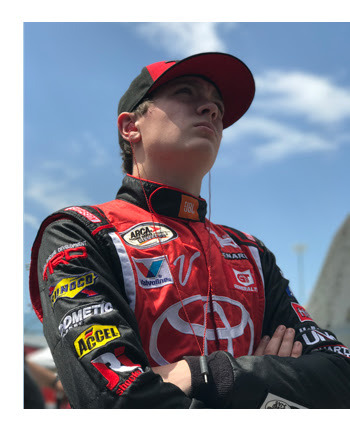 Since 2007, VMS has assisted in the career development of notable NASCAR drivers such as Joey Logano, Erik Jones, William Byron, Justin Allgaier, Alex Bowman, Ryan Blaney, Brennan Poole, Daniel Suarez, and Brandon Jones. Over the years the Venturini name has become synonymous with modern-day racing in America. In 2012, the Venturini family was inducted into the National Italian American Sports Hall of Fame and now find themselves enshrined with such sports icons as Joe DiMaggio, Mario Andretti, Vince Lombardi, Tommy Lasorda and Rocky Marciano.